^ Zebker, H.A., Marouf, E.A., and Tyler, G.L. (1985). “Saturn's rings - Particle size distributions for thin layer model”. Icarus 64 (3): 531-548. Bibcode: 1985Icar...64..531Z. doi:10.1016/0019-1035(85)90074-0. ^ Johnson, R. E.; Smith, H. T.; Tucker, O. J.; Liu, M.; Burger, M. H.; Sittler, E. C.; Tokar, R. L. (2006). “The Enceladus and OH Tori at Saturn”. The Astrophysical Journal (The American Astronomical Society) 644 (2): L137. Bibcode: 2006ApJ...644L.137J. doi:10.1086/505750. ^ Kerr Richard A (2008). “Saturn's Rings Look Ancient Again”. Science 319 (5859): 21. doi:10.1126/science.319.5859.21a. ^ a b c d e f Porco, C.C. ; Baker, E. et al. (2005). 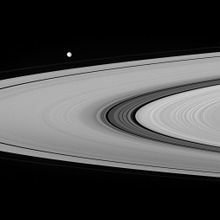 “Cassini Imaging Science: Initial Results on Saturn'sRings and Small Satellites” (PDF). Science 307 (5713): 1226?1236. Bibcode: 2005Sci...307.1226P. doi:10.1126/science.1108056. PMID 15731439. http://ciclops.org/sci/docs/RingsSatsPaper.pdf. ^ Porco, C.; Nicholson, P. D.; Borderies, N.; Danielson, G. E.; Goldreich, P.; Holberg, J. B.; Lane, A. L. (October 1984). “The Eccentric Saturnian Ringlets at 1.29RS and 1.45RS”. Icarus (Elsevier Science) 60 (1): 1-16. Bibcode: 1984Icar...60....1P. doi:10.1016/0019-1035(84)90134-9. ^ Porco, C. C.; Nicholson, P. D. (November 1987). “Eccentric features in Saturn's outer C ring”. Icarus (Elsevier Science) 72 (2): 437-467. Bibcode: 1987Icar...72..437P. doi:10.1016/0019-1035(87)90185-0. ^ Flynn, B. C.; Cuzzi, J. N. (November 1989). “Regular Structure in the Inner Cassini Division of Saturn's Rings”. Icarus (Elsevier Science) 82 (1): 180-199. Bibcode: 1989Icar...82..180F. doi:10.1016/0019-1035(89)90030-4. ^ a b c Hedman, Matthew M.; Burns, Joseph A,; Showalter, Mark R. at al. (2007). “Saturn's dynamic D ring” (PDF). Icarus 188 (1): 89?107. Bibcode: 2007Icar..188...89H. doi:10.1016/j.icarus.2006.11.017. http://ciclops.org/media/sp/2007/2678_7440_0.pdf. ^ Hedman, M. M.; Burns, J. A.; Evans, M. W.; Tiscareno, M. S.; Porco, C. C. (2011-03-31). “Saturn's curiously corrugated C Ring”. Science (American Association for the Advancement of Science) 332 (6030): 708. Bibcode: 2011Sci...332..708H. doi:10.1126/science.1202238. 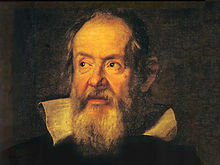 http://www.sciencemag.org/content/early/2011/03/30/science.1202238.short 2011年4月5日閲覧。. ^ Showalter, M. R.; Hedman, M. M.; Burns, J. A. (2011-03-31). “The impact of comet Shoemaker-Levy 9 sends ripples through the rings of Jupiter”. Science (American Association for the Advancement of Science) 332 (6030): 711. Bibcode: 2011Sci...332..711S. doi:10.1126/science.1202241. http://www.sciencemag.org/content/early/2011/03/30/science.1202241.abstract 2011年4月5日閲覧。. ^ a b Esposito, L. W. (2002). “Planetary rings” (PDF). Reports on Progress in Physics 65 (12): 1741-1783. Bibcode: 2002RPPh...65.1741E. doi:10.1088/0034-4885/65/12/201. http://www.iop.org/EJ/article/0034-4885/65/12/201/r21201.pdf. ^ Porco, C.C. ; Thomas, P.C. ; Weiss, J.W. ; Richardson, D.C. (2007). “Saturn's Small Inner Satellites:Clues to Their Origins” (PDF). Science 318 (5856): 1602?1607. Bibcode: 2007Sci...318.1602P. doi:10.1126/science.1143977. PMID 18063794. http://ciclops.org/media/sp/2007/4691_10256_0.pdf. ^ Weiss, J. W.; Porco, C. C.; Tiscareno, M. S. (11 June 2009). “Ring Edge Waves and the Masses of Nearby Satellites”. The Astronomical Journal (American Astronomical Society) 138 (1): 272-286. Bibcode: 2009AJ....138..272W. doi:10.1088/0004-6256/138/1/272. http://www.iop.org/EJ/abstract/1538-3881/138/1/272/ 2009年6月15日閲覧。. ^ Tiscareno, Matthew S. et al. (2006). “100-metre-diameter moonlets in Saturn's A ring from observations of 'propeller' structures”. Nature 440 (7084): 648?650. Bibcode: 2006Natur.440..648T. doi:10.1038/nature04581. PMID 16572165. http://www.nature.com/nature/journal/v440/n7084/full/nature04581.html. ^ Sremčević, Miodrag et al. (2007). “A belt of moonlets in Saturn's A ring”. Nature 449 (7165): 1019?1021. Bibcode: 2007Natur.449.1019S. doi:10.1038/nature06224. PMID 17960236. http://www.nature.com/nature/journal/v449/n7165/full/nature06224.html. ^ Tiscareno, Matthew S. et al. (2008). “The population of propellers in Saturn's A Ring”. Astronomical Journal 135 (3): 1083?1091. Bibcode: 2008AJ....135.1083T. doi:10.1088/0004-6256/135/3/1083. ^ a b c Murray, C. D.; Beurle, K.; Cooper, N. J.; Evans, M. W.; Williams, G. A.; Charnoz, S. (June 5, 2008). 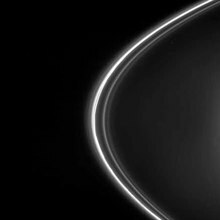 “The determination of the structure of Saturn's F ring by nearby moonlets”. Nature (Nature Publishing Group) 453 (7196): 739-744. Bibcode: 2008Natur.453..739M. doi:10.1038/nature06999. PMID 18528389. http://www.nature.com/nature/journal/v453/n7196/abs/nature06999.html. ^ a b c Hedman, M. M.; J. A. Burns, M. S. Tiscareno, C. C. Porco, G. H. Jones, E. Roussos, N. Krupp, C. Paranicas, S. Kempf (2007). “The Source of Saturn's G Ring” (PDF). Science 317 (5838): 653-656. Bibcode: 2007Sci...317..653H. doi:10.1126/science.1143964. PMID 17673659. http://ciclops.org/media/sp/2007/3882_9284_0.pdf. ^ Spahn, F. et al. (2006-03-10). “Cassini Dust Measurements at Enceladus and Implications for the Origin of the E Ring”. Science (American Association for the Advancement of Science) 311 (5766): 1416-8. Bibcode: 2006Sci...311.1416S. doi:10.1126/science.1121375. PMID 16527969. http://www.sciencemag.org/cgi/content/abstract/311/5766/1416 2008年9月13日閲覧。. ^ Porco, C. C. (2006). “Cassini Observes the Active South Pole of Enceladus”. Science 311 (5766): 1393–1401. doi:10.1126/science.1123013. ISSN 0036-8075. ^ a b c Verbiscer, Anne; Skrutskie, Michael; Hamilton, Douglas (published online 2009-10-07). 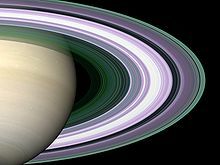 “Saturn's largest ring”. Nature 461 (7267): 1098-100. Bibcode: 2009Natur.461.1098V. doi:10.1038/nature08515. PMID 19812546. http://www.nature.com/nature/journal/v461/n7267/abs/nature08515.html. ^ a b c Cowen, Rob (2009-10-06). “Largest known planetary ring discovered”. Science News. http://www.sciencenews.org/view/generic/id/48097/title/Largest_known_planetary_ring_discovered. ^ Grayson, Michelle (2009-10-07). “Huge 'ghost' ring discovered around Saturn”. Nature News. doi:10.1038/news.2009.979. オリジナルの2009年10月10日時点によるアーカイブ。. https://web.archive.org/web/20091010062431/http://www.nature.com/news/2009/091007/full/news.2009.979.html. ^ Denk, T. et al. (2009-12-10). “Iapetus: Unique Surface Properties and a Global Color Dichotomy from Cassini Imaging”. Science (American Association for the Advancement of Science) 326 (5964): 435-9. Bibcode: 2010Sci...327..435D. doi:10.1126/science.1177088. PMID 20007863. http://www.sciencemag.org/cgi/content/abstract/science.1177088 2009年12月19日閲覧。. ^ Spencer, J. R.; Denk, T. (2009-12-10). “Formation of Iapetus' Extreme Albedo Dichotomy by Exogenically Triggered Thermal Ice Migration”. Science (American Association for the Advancement of Science) 326 (5964): 432-5. Bibcode: 2010Sci...327..432S. doi:10.1126/science.1177132. PMID 20007862. http://www.sciencemag.org/cgi/content/abstract/science.1177132 2009年12月19日閲覧。. ^ Jones, Geraint H. et al. (2008-03-07). “The Dust Halo of Saturn's Largest Icy Moon, Rhea”. Science (AAAS) 319 (5868): 1380-1384. Bibcode: 2008Sci...319.1380J. doi:10.1126/science.1151524. PMID 18323452. http://www.sciencemag.org/cgi/content/short/319/5868/1380.